I made this as a welcome home card for Offspring3. Look at all of the suitcases smiling! Supplies: Stamp – Simon Says Stamp, paper – My Mind’s Eye Hello World, Stampin’ Up! Bermuda Bay, Calypso Coral, Very Vanilla, ink – VersaFine Vintage Sepia, die – My Favorite Things, embossing powder – Stampendous Detail clear. Categories: card, caring, thinking of you | Tags: card, Hello World, My Favorite Things, My Mind's Eye, Simon Says Stamp, Stampendous, Stampin' Up!, Tsukineko, VersaFine | Permalink. This is the other belated birthday card I needed. I scoured my friend’s Facebook page, looking for photos & videos of her dogs. 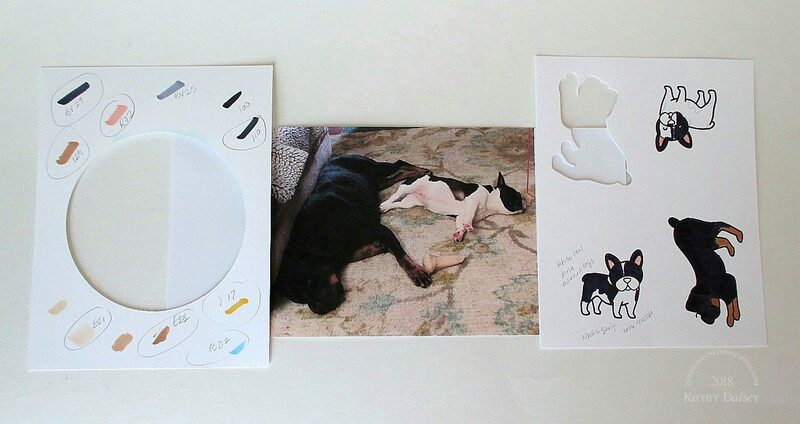 I discovered I need A LOT more practice coloring dogs (and black is particularly difficult) that are supposed to look like actual real dogs! The cake was originally going to be yellow cake with chocolate ganache between the layers. It is those colors. BUT, I know that chocolate is not a dog friendly food item, so, please use your positive imagination to come up with a ganache flavor that would work for dogs. Maybe kibble ganache? Supplies: Stamps – Essentials by Ellen, Lawn Fawn, Impression Obsession, paper – My Mind’s Eye Hello World, Neenah Classic Crest Solar White, Stampin’ Up! Night of Navy, Soft Sky, inks – Copic B02, BV29, E23, E51, R02, Y17, 110, VersaFine Onyx Black, dies – Essentials by Ellen (cake), Lawn Fawn (dogs), Simon Says Stamp (banner), embossing powder – Stampendous Detail Clear. 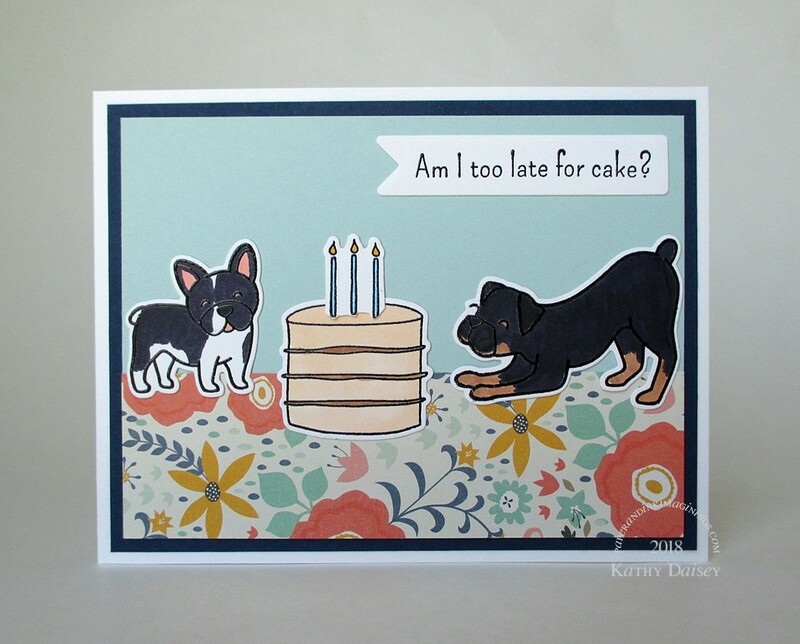 Categories: birthday, card | Tags: card, Copics, Essentials by Ellen, Impression Obsession, Lawn Fawn, My Mind's Eye, Neenah, Simon Says Stamp, Stampendous, Stampin' Up!, Tsukineko, VersaFine | Permalink. 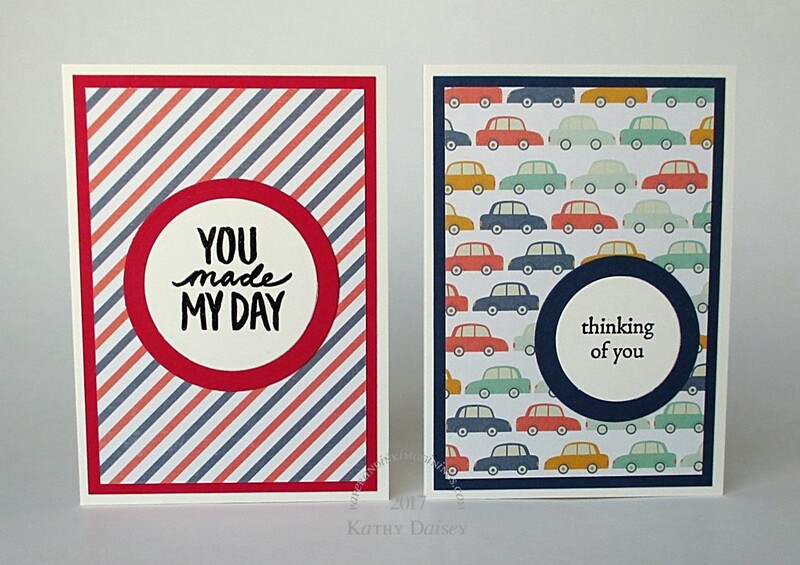 I am working on a request for more “hello” cards, and some that are gender neutral. 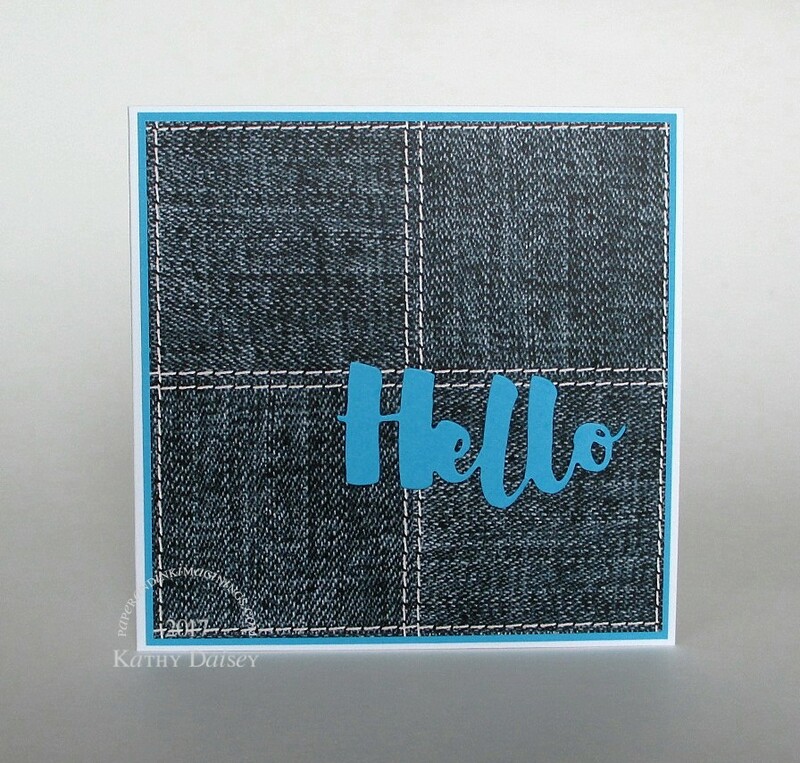 This is a square card (4.25 x 4.25 inches), because of the pattern on the denim paper. And, sadly, this was my last scrap of very old denim paper. I suppose I need to cruise by JoAnn’s and Michael’s to see if either of them have anything similar now. Supplies: Paper – Neenah Classic Crest Solar White, Stampin’ Up! 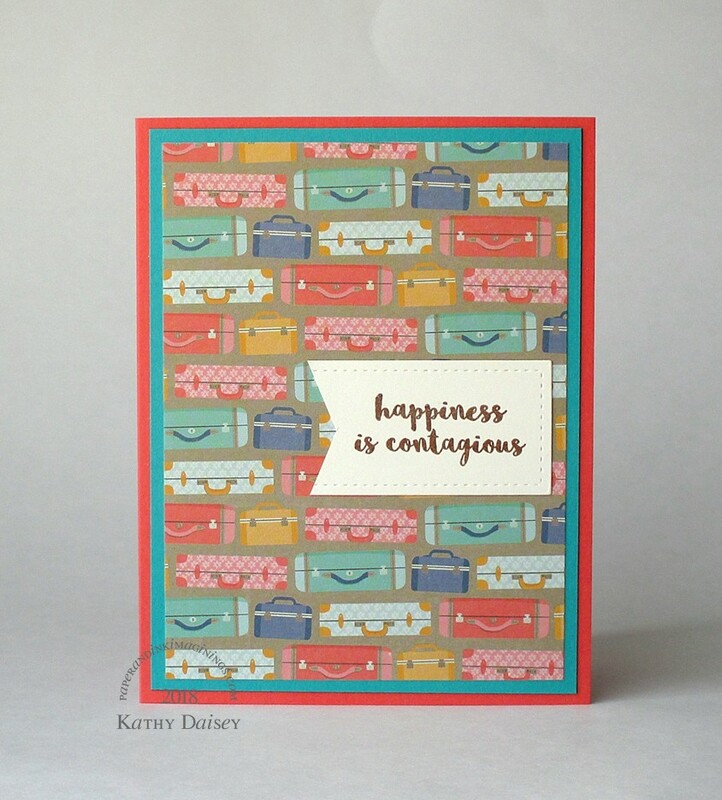 Tempting Turquoise, die – Essentials by Ellen. 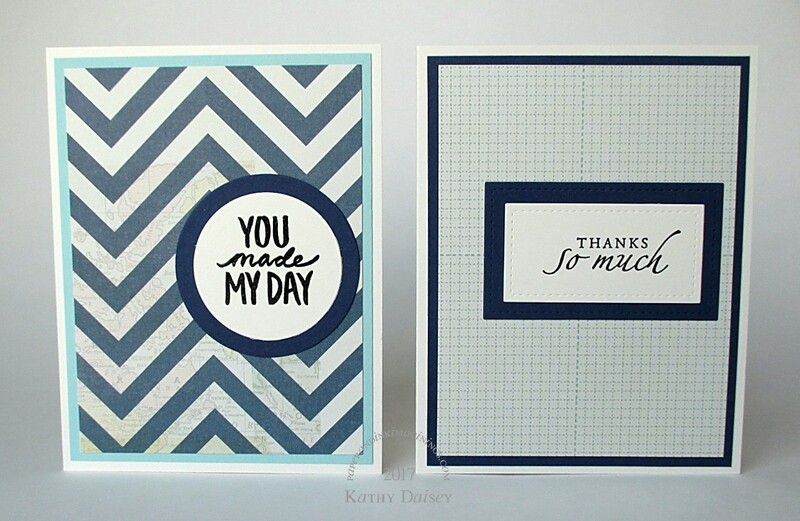 Categories: card, caring, encouragement, thinking of you | Tags: card, Essentials by Ellen, My Mind's Eye, Neenah, Stampin' Up! | Permalink. Here are a few more masculine note cards (my ongoing project). Supplies: Stamps – Stampin’ Up!, paper – My Mind’s Eye Hello World, Papertrey Ink Vintage Cream, Stampin’ Up! Night of Navy, Real Red, ink – VersaFine Onyx Black, dies – Spellbinders, embossing powder – Filigree Fine Art Powder clear. 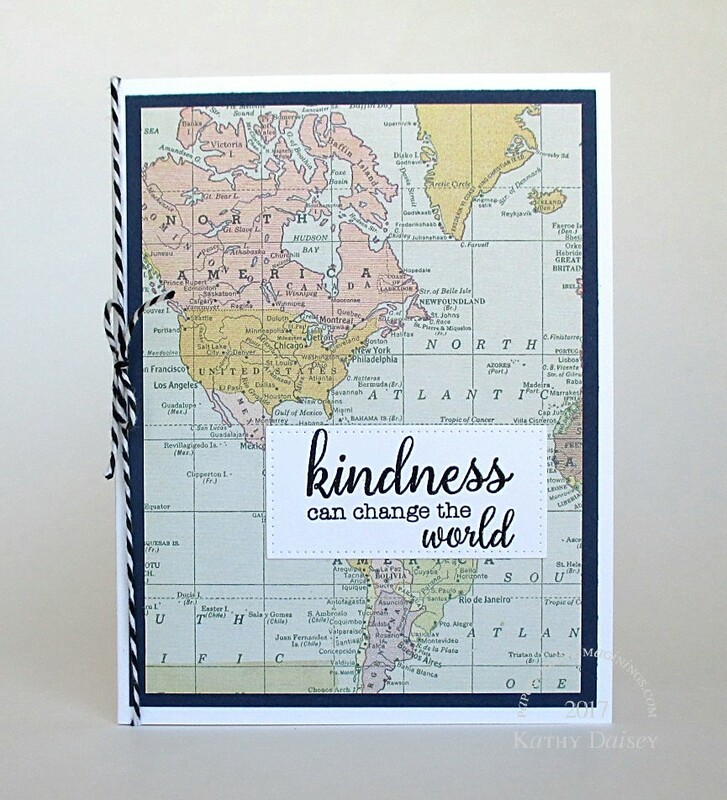 Categories: card, caring, encouragement, note, thinking of you | Tags: card, My Mind's Eye, Papertrey Ink, Spellbinders, Stampin' Up!, Tsukineko, VersaFine | Permalink. I am still working on masculine themed cards this week. Supplies: Stamps – Stampin’ Up!, paper – My Mind’s Eye Hello World!, Papertrey Ink Vintage Cream, Stampin’ Up! Night of Navy, Pool Party, ink – VersaFine Onyx Black, dies – Lawn Fawn (stitched rectangles), Spellbinders (circles), embossing powder – Filigree Fine Art Powder clear. Categories: card, encouragement, thanks | Tags: card, Lawn Fawn, My Mind's Eye, Papertrey Ink, Spellbinders, Stampin' Up!, Tsukineko, VersaFine | Permalink. I thought the map paper played well off the “world” in the sentiment. Supplies: Stamp – Simon Says Stamp, paper – Neenah Classic Crest Solar White, My Mind’s Eye Hello World, Stampin’ Up! Night of Navy, ink – VersaFine Onyx Black, die – My Favorite Things (pierced rectangle), embossing powder – Filigree Fine Art Powder clear, twine – MarkerPOP. Categories: card, caring, encouragement | Tags: card, MarkerPOP, My Favorite Things, My Mind's Eye, Neenah, Simon Says Stamp, Stampin' Up!, Tsukineko, VersaFine | Permalink. Happy Father’s Day to all the father figures in your life. Supplies: Stamp – Stampin’ Up!, paper – California Paper Goods Iridescent Sky, Color Bok, Cosmo Cricket, My Mind’s Eye, Neenah Classic Crest Solar White, Paper Pizazz, Pebbles, ink – VersaFine Onyx Black, dies – My Favorite Things (pierced rectangle), Spellbinders (square), embossing folder – Provo Craft, embossing powder – Filigree Fine Art Powder clear. 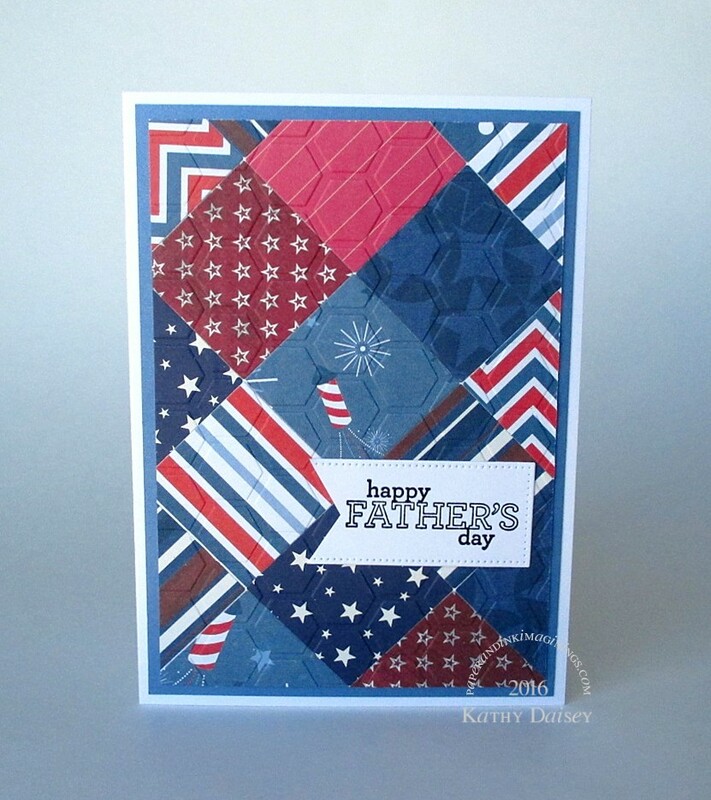 Categories: card, Father's Day | Tags: California Paper Goods, card, Color Bok, Cosmo Cricket, My Favorite Things, My Mind's Eye, Neenah, Paper Pizazz, Pebbles, Provo Craft, Spellbinders, Stampin' Up!, Tsukineko, VersaFine | Permalink.